This morning Goldman Sachs CEO Lloyd "Just Doin' God's Work" Blankfein took the stand in the insider trading case against Galleon Founder Raj Rajaratnam. As expected, Lloyd was asked about alleged tipster Rajat Gupta, the ex-McKinsey managing director and ex-Goldman Sachs board member who supposedly gave Rajaratnam the heads up about a couple of pieces of material inside information about Goldman's financial situation (which led to some lucrative trades for Raj Raj). ASSISTANT MANHATTAN US ATTORNEAY ANDREW MICHAELSON: In this telephone call, did Rajat Gupta violate Goldman Sachs policies? Of course, Lloyd's one liner significantly helps the U.S.'s criminal case against Rajaratnam; it should also help the SEC's pending civil case against Gupta. Later, Lloyd was also asked to explain what happened at the two board meetings in question (after which Gupta called Raj Raj and filled him in some secret details; a tape of one of these calls was again played today). 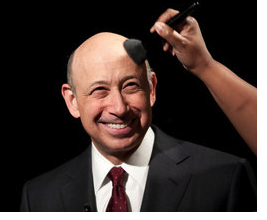 In doing so, Blankfein qualified the 411 that Warren Buffett would be investing $5 billion in Goldman as "big news" (board meeting #1) and said that the info that Goldman was losing money was "significant" (board meeting #2) because, of course, the firm usually banks billions. In other words, according to Lloyd, both pieces of information were material. During cross-examination, John Dowd, Raj Raj's attorney, didn't get much out of Lloyd for his case, other than an admission that Gupta was "a valuable board member."